This is one of dozens of houses owners say are left unfinished by Stephen Dukes and Matt Harden, owners of HD Custom Homes. In December, more than 50 people attended a meeting involving customers of HD Custom Homes. 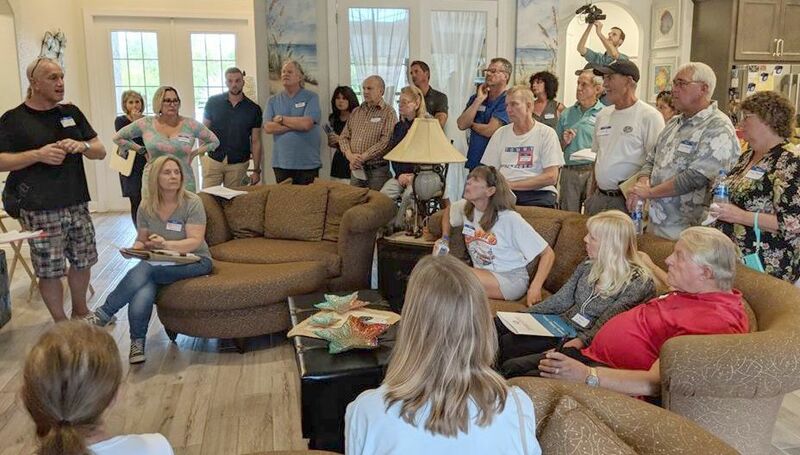 Many spoke about what was not finished or not started with their homes mostly in Charlotte and Sarasota counties. 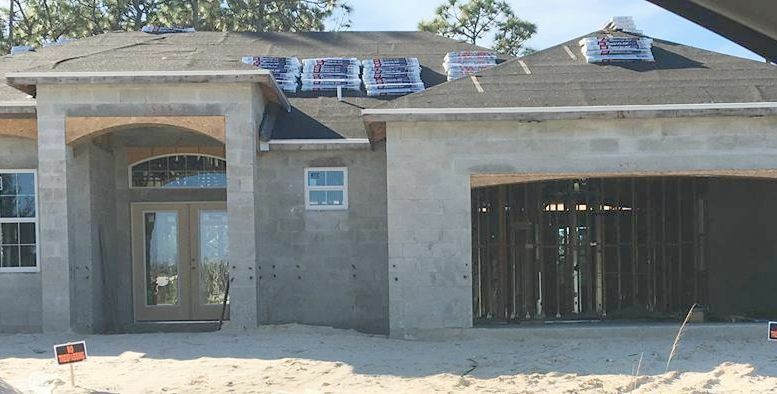 Dozens of former customers of HD Custom Homes could be eligible for some of the $500,000 that’s in a Florida recovery construction fund. The problem for homeowners who say they’ve lost thousands in deposits from the local defunct builder is navigating the process to get money. The process is time-consuming and complicated. Last year, HD Custom Homes owners Matthew Hardin and Stephen Dukes abruptly closed the doors to their model home and stopped answering calls from many customers. The pair were selling an average of six homes a month. But some were never finished and others never started. About 38 customers have claimed they are out hundreds of thousands of dollars they paid the company. Sub-contractors who worked for HD Homes also say they weren’t paid for work and materials. HD Custom Homes clients and subcontractors estimate the builders owe $8 million in deposits and services. In order to bring attention to the issue, homeowners filed complaints with the Charlotte County Building Department, the state construction industry licensing board, the state attorney general and even sent letters to the governor. Homeowners hoped to get some of their money back through this civil process. On the criminal side of the situation, dozens of homeowners filed complaints with the Charlotte County Sheriff’s Office alleging they are victims of fraud by HD Custom Homes. The Attorney General’s office responded and is currently investigating HD Custom Homes. The Charlotte County Sheriff’s Office Economic Crimes Unit is “still examining the facts and evidence of each case to check for criminal violations,” according to Katie Heck, CCSO spokesperson. Hardin voluntarily surrendered his general contractor’s license to the state. He was fined $250,000 and $735.24 in investigative fees by the Construction Industry Licensing Board. If he ever wants to get his license reinstated, he must pay the fines first, the administrative order shows. Because Hardin and Dukes ceased operation of HD Custom Homes, about 50 of their customers are trying to get money from the state Homeowners’ Constitution Recovery Fund. The state fund is for homeowners left with nothing after a builder defaults. It’s the last resort for homeowners to try to recover any monies to finish building their homes. The state gives each customer — who properly submitted all required civil paperwork — up to $50,000 from a pot of $500,000 for all claims against a particular builder. Despite some HD Custom Homes clients losing more than $200,000, they still only qualify for $50,000 through the state recovery fund. The fund, which operates on a first-come, first-served basis, requires homeowners to take certain steps against the builder to try to get deposits back before they can get state funds. The legal requirements mean homeowners must complete in a timely manner, which can pit homeowners against each other as they race to the state recovery fund. Most distressed builders owing large sums of money to customers, subcontractors and suppliers seek bankruptcy protection. That allows customers to go to court and prove they tried to get a judgment against the builder. It is one of the qualifications for homeowners to qualify for the state recovery fund. HD Custom Homes did not declare bankruptcy — leaving customers to take an additional step in their quest for the state recovery funds. The affected customers must now force the company into involuntary bankruptcy in order to satisfy one of the many requirements to apply for up to $50,000 from the state recovery fund. Three homeowners represented by Sarasota attorney Alan Tannenbaum are trying to do just that as they recently filed an involuntary bankruptcy proceeding against HD Custom Homes. Tannenbaum said that all affected homeowners, even those who aren’t his clients, will soon be notified they can file claims with the federal bankruptcy court in Tampa. Proof of a bankruptcy discharge against HD Custom Homes satisfies the requirement for homeowner’s seeking recourse against the builder, Tannenbaum said. Last week, the Construction Industry Licensing Board sent letters to some HD Custom Homes customers reporting that it investigated Hardin and fined him the $250,000, and that some customers may be entitled to restitution. Some of the 20 homeowners may view the letter as a way to skip the bankruptcy process and move first in line for the state recovery fund. Tannenbaum cautions them, saying while the restitution order creates a path to the state recovery fund because it shows Hardin was fined, the homeowners must still try to get their money back from HD Custom Homes and Hardin through a civil processes. Homeowners who opt to bypass the upcoming involuntary bankruptcy court hearing in Tampa could be rejected from the recovery fund and sent to the back of the line, he said. “Filing claims now would be premature given the bankruptcy proceeding hasn’t occurred yet,” said Tannenbaum, who has pursued recovery funds claims for more than a decade. The other problem with the letter and state’s restitution order, Tannenbaum said, is they are vague. The paperwork doesn’t list the amount Harden owes each of the 20 homeowners who received the letter. Therefore it’s not proof of a true judgement against HD Custom Homes, he said. Tannenbaum said any homeowners filing a recovery fund claim now based on the “unliquidated restitution order” would bypass the involuntary bankruptcy process and have to go after Hardin and Dukes to get assets which are the property (lots) they own. Tannenbaum said the state should be explaining the process better to the homeowners, who may end up being rejected for recovery funds due to lack of evidence after using the state’s vague restitution administrative order. “Incomplete explanations to these homeowners will cause confusion among folks who are already traumatized by what this builder has done,” Tannenbaum said. Tannenbaum is handling nine homeowners vying for the recovery fund. If all of his clients are awarded $50,000 each, much of the $500,000 in the fund will be depleted. Long great article except for the spelling of "Harden"